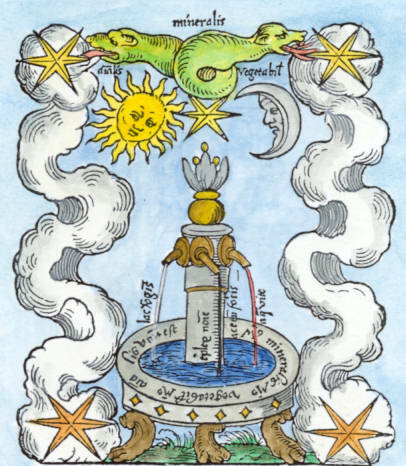 The Rosarium philosophorum (the Rosary of the Philosophers) was first printed at Frankfurt in 1550 as the second part of an alchemical compendium De Alchimia opuscula complura veterum philosophorum. 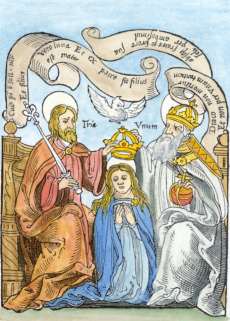 Its has nothing to do with the Catholic idea of the rosary, but this term 'Rosarium' referred to a gathering of sayings of philosophers. 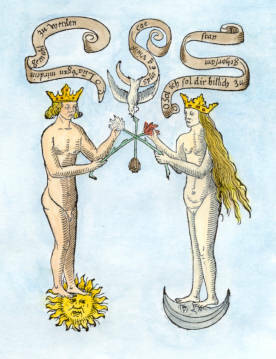 The Latin text of the Rosarium is just this, a collection of the sayings of alchemical and other philosophers. 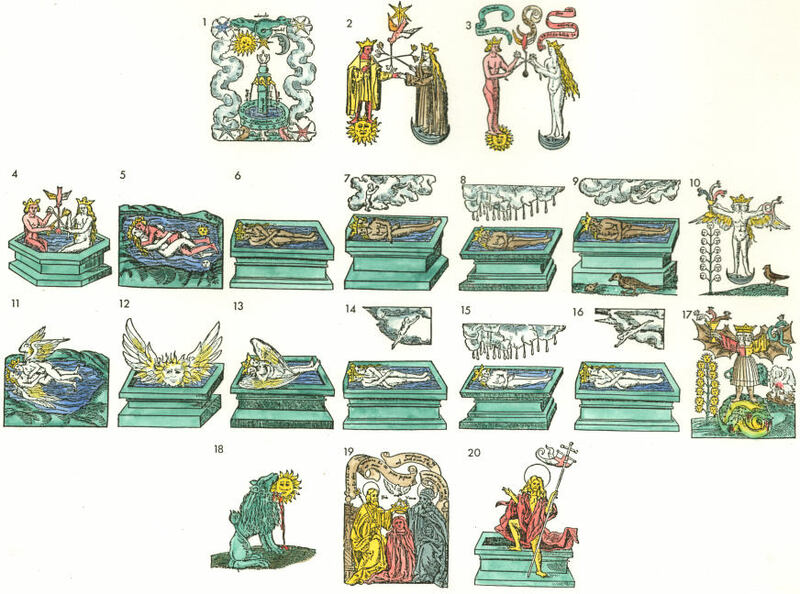 The text is in itself quite interesting but it very much enlivened by the inclusion of a series of 20 woodcuts. 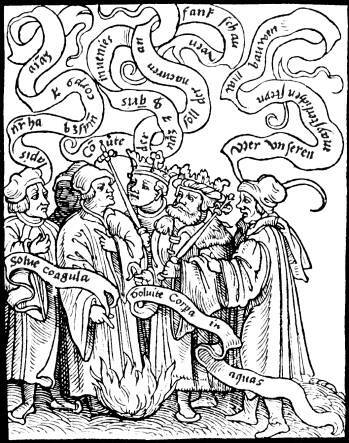 There is a further woodcut on the title page which shows six philosophers disputing and this links us with the idea of a 'Rosarium' as a collection of their sayings. 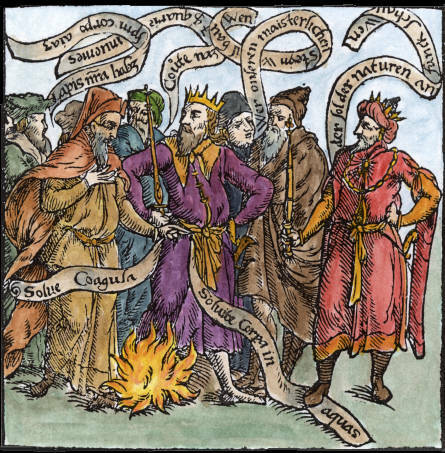 The series of 20 woodcuts appears with German text (not the Latin of the text of the book) of some verses, and thus it may have been taken from some other printing project for a book in German. 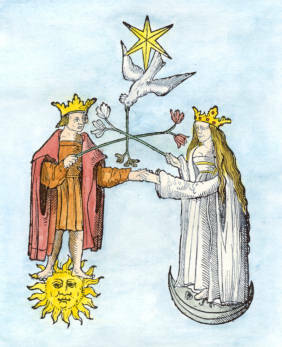 We will see later there is a German manuscript with some similar images apparently predating the Rosarium. 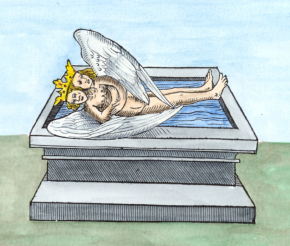 Woodcut from the 1550 edition. 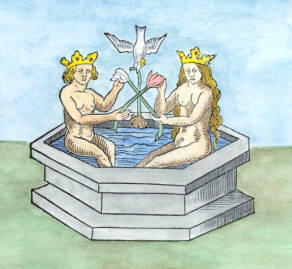 Woodcut from a later edition. This is a very conventional image and has little emblematic content that needs explanation. A cursory examination of these images shows that they have two internal subsequences. This will become obvious if we arrange them in this pattern. 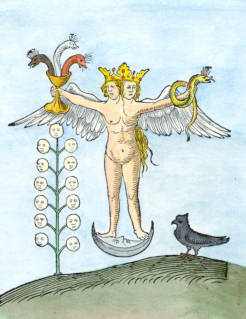 One can see that there are two similar subsequences 4-10 and 11-17, one where the male figure seems to dominate and the second where a female figure separates from and then reunites with the hermaphroditic body. 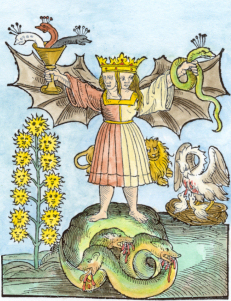 These structures that often underlie alchemical emblem sequences have been extensively investigated by Adam McLean and included in his study course on alchemical sequences. Go to side gallery of Artis auriferae printed version. Go to side gallery of Mylius printed version. 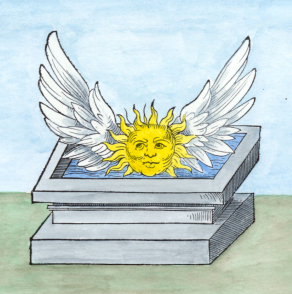 There are many manuscript copies of the Rosarium philosophorum, some only having a transcription, summary, or translation of the text without the images. 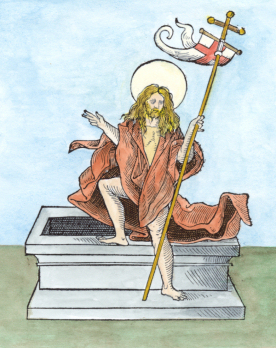 About 30 manuscripts have been found which have the emblematic figures, some as line drawings and some as coloured drawings, which are listed here. British Library MS. Sloane 2560. [late 16th Century]. British Library MS. Add. 29895. [late 16th Century]. Bodleian Library MS. Ashmole 1487. 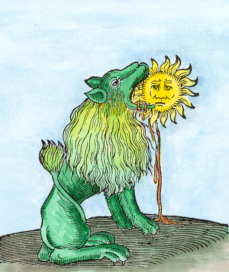 [late 16th Century]. 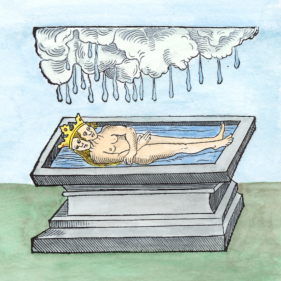 London, Wellcome Institute MS. 1091. London, Wellcome Institute MS. 4256. None of the manuscripts found so far predate the 1550 printed edition. Go to side gallery of images from some of these manuscripts.